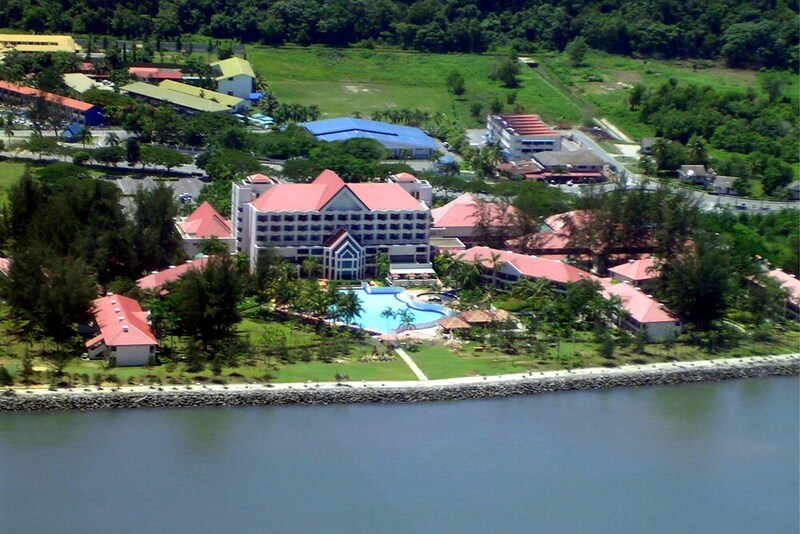 Located in Miri, this beachfront resort is in the city center, 0.3 mi (0.5 km) from Tanjong Lobang Beach, and 2.3 mi (3.8 km) from Imperial Shopping Mall. Marina Beach and Bintang Plaza are also within 3 mi (5 km). Catch some rays at the beach or spend the day relaxing at Miri Marriott Resort & Spa's full-service spa. Then enjoy a meal at one of the resort's 2 restaurants. All 220 rooms feature thoughtful touches like bathrobes and slippers, plus 24-hour room service and plasma TVs with satellite channels. Guests will also find WiFi, wired Internet, and minibars. In addition to a full-service spa, Miri Marriott Resort & Spa features an outdoor pool and a sauna. Dining is available at one of the resort's 2 restaurants and guests can grab coffee at one of the 2 coffee shops/cafés. The property also has a snack bar/deli. Guests can unwind with a drink at one of the resort's bars, which include a beach bar, a swim-up bar, and a bar/lounge. Public areas are equipped with wired and wireless Internet access (surcharge). Business-related amenities at this 4.5-star property consist of a business center and a meeting room. Event facilities measuring 2067 square feet (192 square meters) include conference space. This luxury resort also offers a children's pool, a 24-hour fitness center, and spa services. For a surcharge, a roundtrip airport shuttle (available 24 hours) is offered to guests. Complimentary self parking is available on site. Miri Marriott Resort & Spa has designated areas for smoking. Buffet breakfasts are available for a surcharge and are served each morning between 6:00 AM and 11:00 AM. Zest - This beachfront restaurant serves breakfast, brunch, lunch, and dinner. Guests can enjoy alfresco dining (weather permitting). A children's menu is available. Borneo Baking Company - Overlooking the garden, this delicatessen serves breakfast, lunch, and dinner. Guests can enjoy alfresco dining (weather permitting). Lush Bar - Overlooking the ocean and pool, this pub serves dinner only. Guests can enjoy drinks at the bar. Matahari Pool Terrace - This beachfront café serves breakfast, lunch, and dinner. Start your morning with a buffet breakfast, available each day from 6:00 AM to 11:00 AM for a surcharge. You can order up room service around the clock. Mandara Spa has 6 treatment rooms. Services include hot stone massages, facials, body treatments, and manicures and pedicures. A variety of treatment therapies are provided, including aromatherapy. The spa is equipped with a sauna and a spa tub. Rollaway/extra beds are available for MYR 100.0 per night. This property offers transfers from the airport (surcharges may apply). Guests must contact the property with arrival details before travel, using the contact information on the booking confirmation. Reservations are required for massage services and spa treatments. Reservations can be made by contacting the resort prior to arrival, using the contact information on the booking confirmation. The property has connecting/adjoining rooms, which are subject to availability and can be requested by contacting the property using the number on the booking confirmation. No pets and no service animals are allowed at this property.